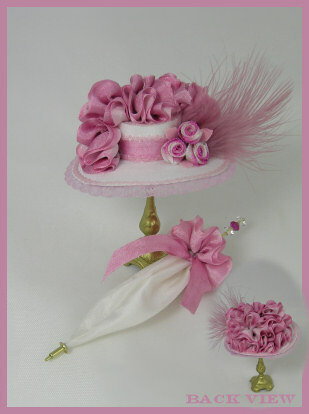 Learn how to hand dye silk ribbon with varigated colors and make this gorgeous hat. A thick profusion of gathered silk ribbon spills around and over the top of the hat, and ribbon roses are added for an extra accent. This design is total elegance. A matching silk parasol is trimmed with dyed silk ribbon and swarovski crystals.